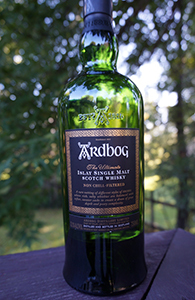 The Ardbog was Ardbeg’s special Feis Ile release for 2013. I can’t recall off the top of my head if Ardbeg had any other special releases last year—it’s hard to keep up with them. With Ardbeg’s latest noisy releases on the market now—the new Supernova just came out—it seems like as good a time as any to review this one (I’ve had the bottle open for a long time). It is a vatting of Ardbeg of different styles, particularly ex-bourbon and ex-manzanilla sherry and it is 10 years old. It originally retailed between $89 and $120 in the US—if you’re keeping count this means it went for 2x-3x the price of the regular 10 yo. It didn’t all go though—there’s still some available.